for perfecting us more each day. of the love of Christ. and know the hope of his calling. by his spirit in the inner man. and how to be rooted and grounded in love. and of the knowledge of the love of Christ. that is the body of our Lord Jesus. 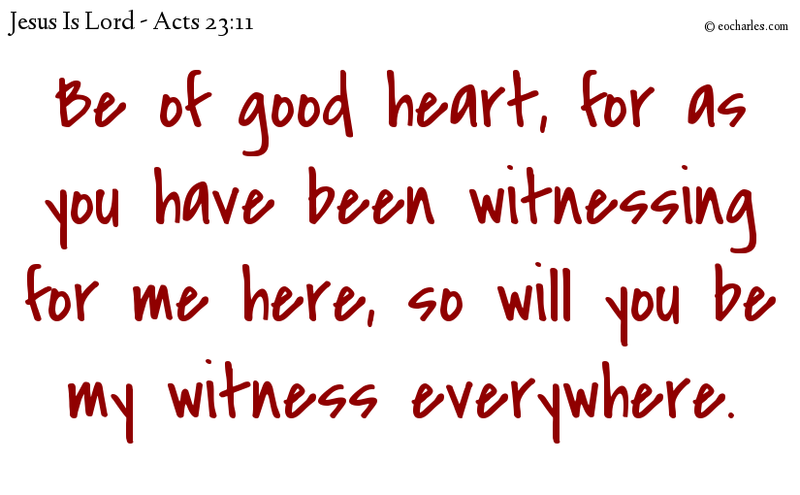 And the night after, the Lord came to his side and said, Be of good heart, for as you have been witnessing for me in Jerusalem, so will you be my witness in Rome. 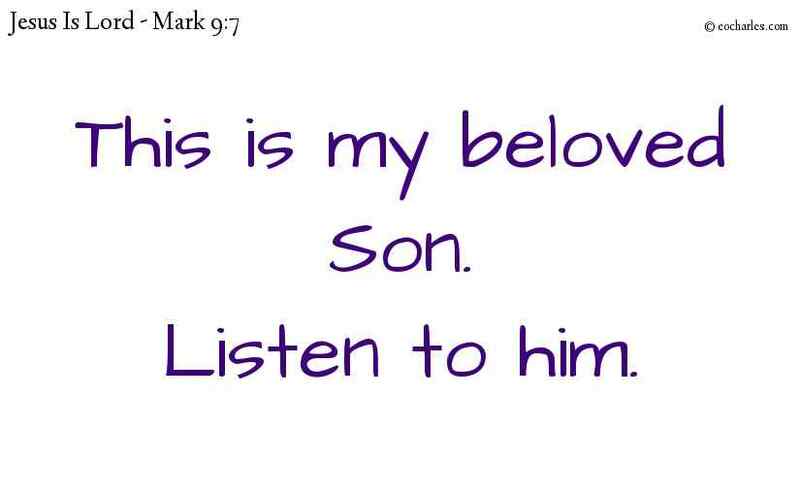 And a cloud came over them; and a voice came out of the cloud, saying, This is my dearly loved Son, give ear to him. 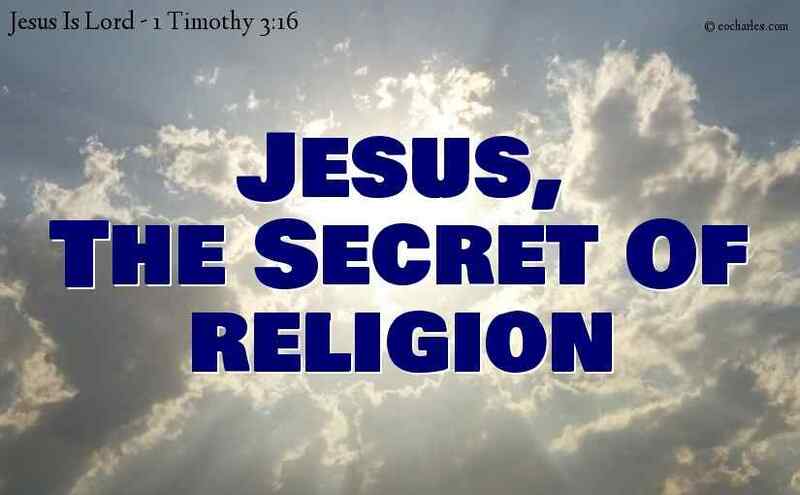 And without argument, great is the secret of religion: He who was seen in the flesh, who was given God’s approval in the spirit, was seen by the angels, of whom the good news was given among the nations, in whom the world had faith, who was taken up in glory. 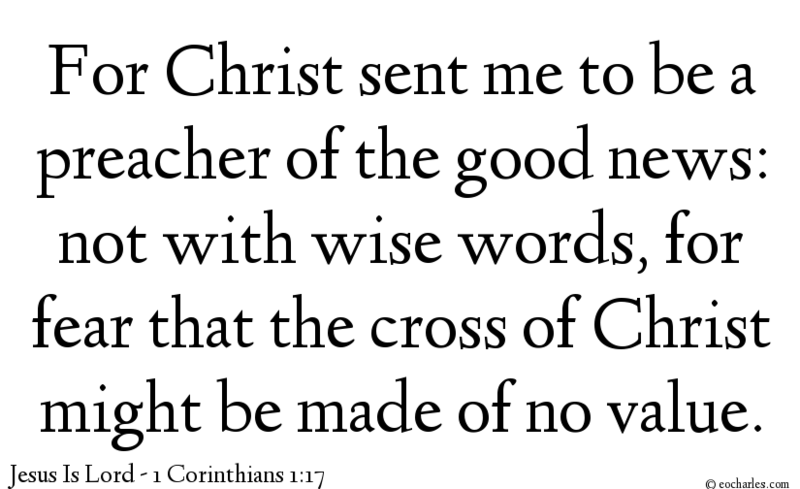 1Co 1:17 For Christ sent me, not to give baptism, but to be a preacher of the good news: not with wise words, for fear that the cross of Christ might be made of no value. I am thankful because now no one can say that you were baptized in my name. Christ did not give me the work of baptizing people. He gave me the work of telling the Good News. But he sent me to tell the Good News without using clever speech, which would take away the power that is in the cross of Christ. The teaching about the cross seems foolish to those who are lost. But to us who are being saved it is the power of God. So what does this say about the philosopher, the law expert, or anyone in this world who is skilled in making clever arguments? God has made the wisdom of the world look foolish. This is what God in his wisdom decided: Since the world did not find him through its own wisdom, he used the message that sounds foolish to save those who believe it.